I’m looking out my window to where my old BMW 3-series is parked. It’s getting a bit long in the tooth now, and even though all BMWs are well made and last for ages, I might have to consider replacing it eventually. And when I do, what better to replace my old three-series than with a newer version of the same thing – say, for example, with the BMW 335d? The BMW 335d hasn’t quite made it over to Australia, so I’ll have a while to wait until it arrives. And we’ll also have to wait until all is revealed about the exact details of the features. But if what’s out in the UK is anything to go by, we should be in for a treat. The BMW 335d is available in a range of models, all with different features to recommend them. It all depends on the sort of body style and the level of trim and luxury you’re after. If you want an ordinary (if such a word can be applied to a BMW) sedan, then you’re after the 335d SE or the 335 M Sport. If you want a Touring model (BMW’s name for a station wagon or estate car), then you’ve got the same choice: SE and M Sport. If the sleek lines of a coupé are more your thing, then you have a slightly wider range of choice, as you not only have the SE and M Sport options, but you also have the BMW 335d SE Highline and M Sport Highline options. My choice here – one of the Touring models. I like having the larger load space of a station wagon. What all these BMW 335d models have in common is the engine. Looking at the technical specifications of the BMW 335d, this 3-litre six-cylinder common-rail diesel unit has a maximum power output of 210 kW at 4400 rpm, and a very, very nice looking maximum torque figure of 580 Nm at 1750 rpm, so if the load space in the back of the station wagon isn’t big enough (or if I go for the sedan in the unlikely case that the Touring variant doesn’t make it into Australia), I’ll have plenty of twist available for towing. This diesel engine comes rigged up to a six-speed automatic transmission. Safety’s an important consideration when choosing any new car, especially if it’s being used as a family car (actually, it’s crucial for any car – adults get damaged almost as easily as children, and parents don’t have a monopoly on responsibility). And the BMW 335d has a satisfyingly long list of safety features. Specifically, these are the airbags (driver and front passenger front and side airbags, plus ITS head airbags front and rear); the Dynamic Stability Control Plus system, which incorporates ABS brakes, Automatic Stability Control, Cornering Brake Control, Dynamic Brake Control, EBD and engine drag torque control, brake drying, brake fade compensation, hill start assistance and brake pre-tensioning; Dynamic Traction Control, which also makes the BMW 335d’s on-road performance very responsive and grippy; pyrotechnic pretensioned and load-limited seatbelts in the front (ordinary 3-point inertia reel seatbelts for the three rear seats) and anti-whiplash head restraints in the front seats. The list of standard equipment available for the BMW 335d SE Touring is pretty impressive (this is what’s available in the UK – hopefully, we’ll get something similar when the BMW 335d gets to Australia). The BMW 335d SE is fitted out with power steering, cruise control, rear park assistance, dual-zone automatic air conditioning, electric windows with finger-tip protection, an engine start/stop button, a leather trimmed sports steering wheel with wheel-mounted gearshift paddles, and a six-speaker CD audio system with an auxiliary input jack. The seats are as comfortable as BMW can make them, which means that they’re very comfortable indeed. The rear seats in the Touring model fold flat to increase the load space, and all models have the rear arm rest and lots of cabin storage space. And as for the BMW 335d M Sport model… Well, this has all the features of the SE version but adds in the special M-Sport suspension, which makes the car highly responsive and extremely fun to drive, and the M body kit that not only enhances the road-handling ability of the BMW 335d but also looks pretty snappy, but without the in-your-face looks of some sports body kits. 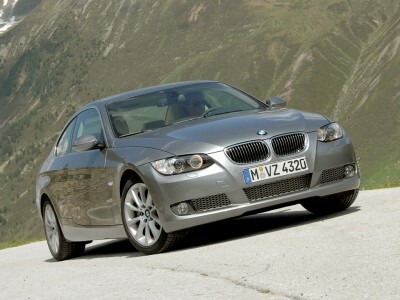 The BMW 335d SE Highline version is only available with the coupé body style. This variant has improved safety airbags, engine drag torque control, optimum shift indicator, Xenon headlights, leather upholstery on the four seats provided, front sports seats and (at least in the UK) Bluetooth mobile phone preparation. A word or three needs to be said about the lights in the BMW 335d – you could almost have a separate article dedicated just to these lights. These are halogen lights with twin side light corona rings, which means that they’re very impressive to look at, and these are complemented beautifully by fog lights front and rear. BMW has fitted the 3335d’s lights with the follow-me-home function, which allows you to turn the lights on while you’re out of the car walking to your home – or to your car. If you’re leaving the car, the lights will turn themselves off automatically, so you won’t have the all-too-common problem of announcements coming over a PA system saying “Will the owner of a white BMW 3-series, registration number….” The lights are also fitted with a headlight wash function and a rain sensor which automatically switches the headlights on when it gets dim. Can’t wait until the BMW 335d gets to Australia. Just as well the old three-series BMW I already have is so reliably made that it will last until the first BMW 335d rolls into Sydney and will then have a bit of trade-in value. For any more information on the BMW 335d, or for that matter any other new car, contact one of our friendly consultants on 1300 303 181. If you’d like some fleet discount pricing (yes even for private buyers! ), we can submit vehicle quote requests out to our national network of BMW dealers and come back with pricing within 24 hours. Private Fleet – car buying made easy!